On July 7th, 2014, I wrote a post about how I had a prophetic dream – a dream that would launch me into making my film on intuition. What really launched me though was not the dream itself, but that I woke up out of that dream at 4:44am. 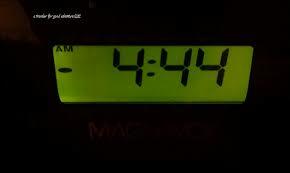 I immediately Googled What does 444 mean? And I was shocked at the response. What I read would change my life. I mention this now because that post, strangely, is my most read post ever. Every day, it’s read by people around the world. And I wrote that post two and a half years ago. How many people? I don’t know. I guess I could add the figures, if I had the time and inclination. I have neither. But I notice, when I go through the analytics for this site, that every day that post appears towards the top of the posts that are read that day. I didn’t even tag the post. I don’t do any of those nifty things that draw people to your site. I figure that if people find me here, they find me – and if they want to stay, they’ll stay. What is it about that post that attracts people? Well, it’s startling. I found the whole thing startling at the time. I still find it startling. And as I say, that dream, and 444, changed my life. I am here, and read (most of the time, I guess I have to say now) when you post! Busy lives. Oh look, you responded to me at 11:11….the spiritual alarm clock…..”Wake-up, tune-in, we have a message for you!” Thanks my friend! haha – that’s very cool – 11:11. ! Daniel, you and Joni need to immediately sell your beautiful house and shift next door, so you live at 4444! !